Pretty up the patio or garden with the lovely Amish Yellow Pine Royal English Dining Chairs. These are the perfect outdoor wooden chairs for lounging or dining. Strong and sturdy pine wood makes a fine presentation in these spacious outdoor chairs that embrace you in comfort. There's room to get cozy as you eat outside on your patio or porch. 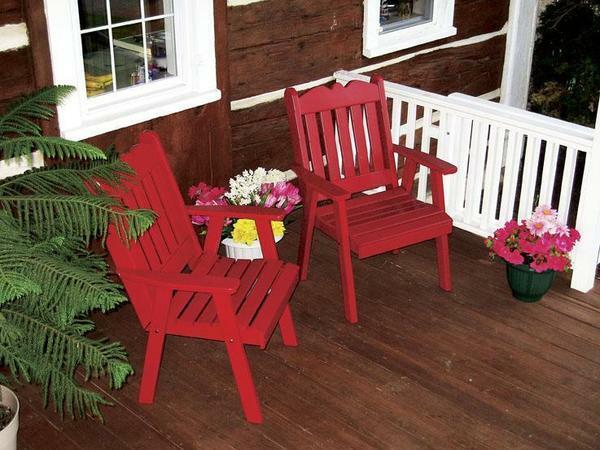 Creating an inviting scene is made easy with our attractive pine outdoor furniture. These Royal English Dining Chairs offer a versatile style to support formal outdoor functions as well as casual barbecues. The graceful design of the top chair rail is a testament to the talent of the gifted Amish craftsman who sculpt and shape them. Amish made furniture provides customization options that you can enjoy. Create the outdoor furniture you're looking for with these choices. Pick paint or stain for your pine wood chairs. Enjoy a natural, stained look, or brighten the scene with color. We are happy to send samples for you to work with. Add pine cup holders for convenience. Have fun with fabrics and choose from our Sundown Fabrics Collection to add the throw pillows you like best. There's nothing like enjoying the outdoors surrounded by loved ones. Let us create the perfect furniture for your family. Email or call us today at 866-272-6773.